"always welcome at our traditional irish bar"
Looking for a Hotel Bar with Traditional Irish Music and a great Bar Menu serving Bar food, Pub food or Pub Grub? Whatever you want to call it by, among all the bars in Tralee, the Pikeman is your man! The Pikeman Bar is very popular with both the Tralee and North and West Kerry locals as well as guests from further afield. In keeping with the ambience of the Grand Hotel itself, the Pikeman Bar is a traditional style Pub. We offer a lively breakfast and coffee morning to the early customer. Our in-house French pastry chef, David, will be delighted to tempt you with his freshly baked scones, Irish brown bread, pastries and desserts with your freshly brewed tea or coffee. 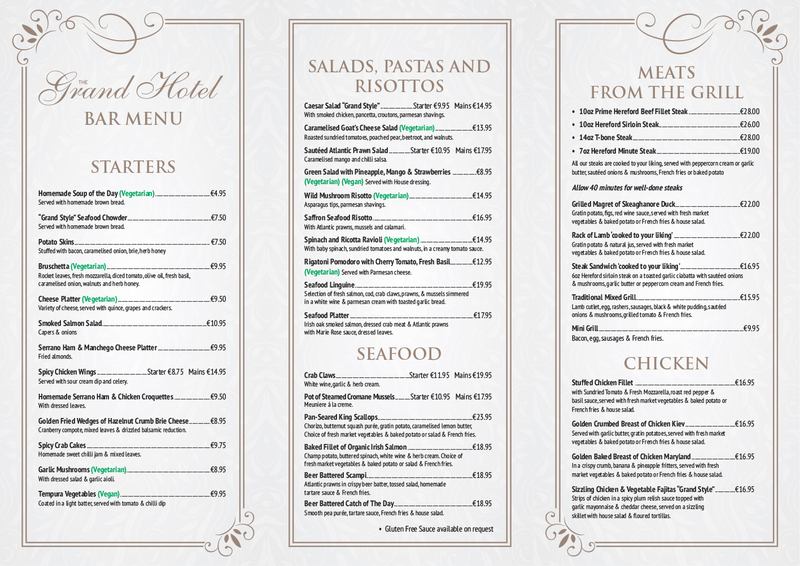 Our Bar Food menu is second to none and offers a wide and extensive choice to cater for all tastes and budgets. Food is served in the Bar from 8.30am to 9.30pm daily.